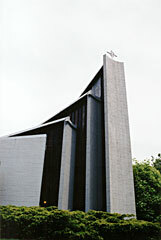 St. Canice's is a strong geometric building. Four stepped triangular sections radiate out like a fan, each section lower than the last. The steps between the levels, both horizontal and vertical, let light through to the interior. 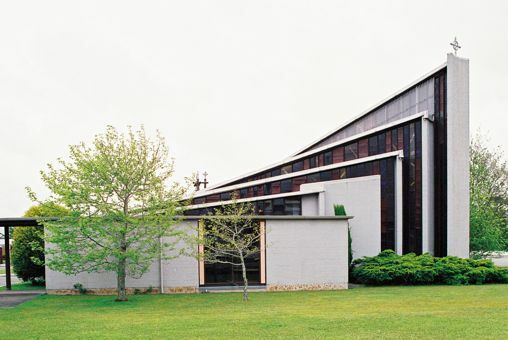 Scott's solutions to the problems created connecting the four main pieces of the building create dramatic shapes and details, both inside and out, and seem deliberate rather than just fortuitous. 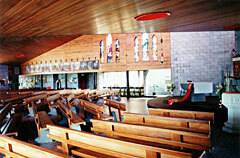 Inside, sitting on the right, the church feels mellow with expanses of matai across the ceiling but on the left, it is alive with coloured light entering through the spaces above. This is a wonderfully imagined building. It has a logic and elegance of its own. 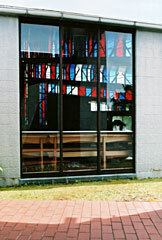 The shapes and spaces arise because of the connections between the parts of the building. 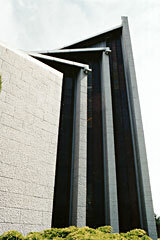 Inside there is drama with high soaring pillars inter-cut with light from floor to ceiling. And, like all Scott's buildings, the proportions are perfect. The size and scale are right, and even the semi-circular annex at the side seems essential to complete the building. 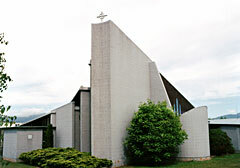 The ideas explored in this church are similar to Scott's other churches, yet the solution is unique. 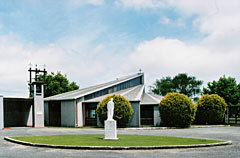 All Scott's churches have a single geometric idea at their core: the Futuna is a cube, quartered, deconstructed and reconstructed, Our Lady of Lourdes is made from triangles, connecting and intersecting, St. Joseph the Worker is a series of boxes stepped from front to back, St. Mary's is all curves, St. Canice's is essentially a fan. 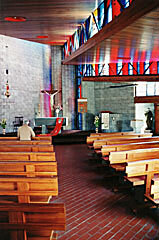 Each church is focused on the front, the altar. The materials are familiar to Scott: cast concrete or concrete block, stained wood, coloured acrylic, hard floors, timber. Door and window details are signature Scott. 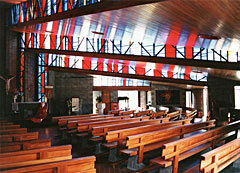 But the realisation of the big idea in each church, the complex geometry, is always new and original. The reward in studying Scott's buildings is that they reveal themselves slowly, the details, while delightful on their own, connect together to form a whole much greater than the sum of the parts.